Explore the many aspects of beauty. 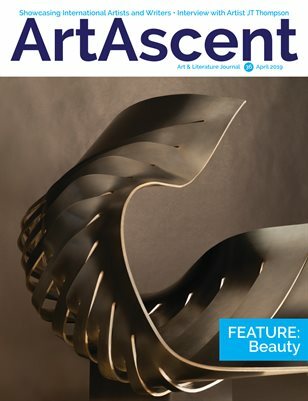 This 36th, 96-page issue explores the theme "Beauty" via inspiring sculpture, paintings, photography, illustrations, mixed media, poems and stories and more by international, emerging and indie artists and writers. If you love art - both visual and written - you'll love ArtAscent. Featuring: John Patkau, Johanna Porter, Leah Dockrill, Agnieszka da Silva Szyszka, Jason Andrescavage, Donna Barati, Theodore Heublein, Thelma Pott, Yihan Chang, Sean Stone, Eva Maria Hunt, HOUDA BAKKALI, Khalida Kuzmina, Kate Greenway, Shawn Robichaud, Candi S. Kalinsky, Supreetha Tiru, Rin Svart, Natalia Petkov, Hannah Craven, Josip Miskovic, Theresa E Wilshusen, Barbara Simcoe, Yvette Young, Chynna Laird, Henry Sheeran, Linda C. Belans, Ursula Beaumont, Kate Greenway, Krystle Vermes, Paul Hoy, Vacen Taylor, Samantha Browne, Beatrix Koch and JT Thompson.